Let’s talk about the untrimmable spaces. 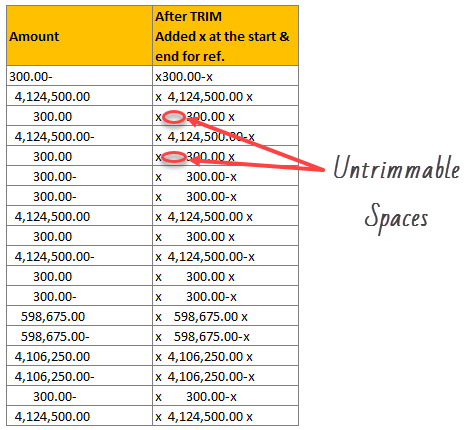 We all know that TRIM() removes extra spaces from the beginning, ending and middle of a text. We can use CLEAN() function to remove non-printable characters (like the ASCII codes 0 to 31). Of course, SPACE is technically a printable character, so CLEAN() won’t remove spaces. Naturally I tried to TRIM(). But the data won’t budge. See above. Recently my iPhone 4 crashed. It is 3.5 years old. And just like any other 3 year old, it started acting weird & crazy one night. The next morning it went silent. It won’t go beyond the Apple logo whenever I start it. Since I couldn’t wait for the phone to start, I took out the SIM card (the phone is unlocked, if you are wondering) and placed it in my old Nokia phone. But alas, none of my contacts are on the SIM. They are in “cloud”. After a day of answering phone calls from everyone including my mom as “Chandoo here”, I’ve decided to get my contacts back. So I logged in to iCloud to download a backup. And the backup was a .VCF file. Since I wanted to have all my contact numbers in a spreadsheet, I did what any Excel nerd would do. 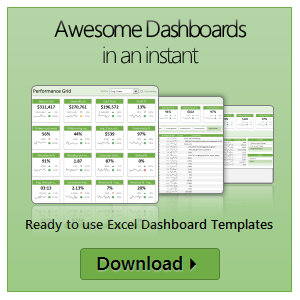 I built a template that can convert VCF data to Excel worksheet.